The purpose of this tutorial is to introduce new users to GMT, outline the GMT environment, and enable you to make several forms of graphics without having to know too much about UNIX and UNIX tools. We will not be able to cover all aspects of GMT nor will we necessarily cover the selected topics in sufficient detail. Nevertheless, it is hoped that the exposure will prompt the users to improve their GMT and UNIX skills after completion of this short tutorial. The GMT system was initiated in late 1987 at Lamont-Doherty Earth Observatory, Columbia University by graduate students Paul Wessel and Walter H. F. Smith. Version 1 was officially introduced to Lamont scientists in July 1988. 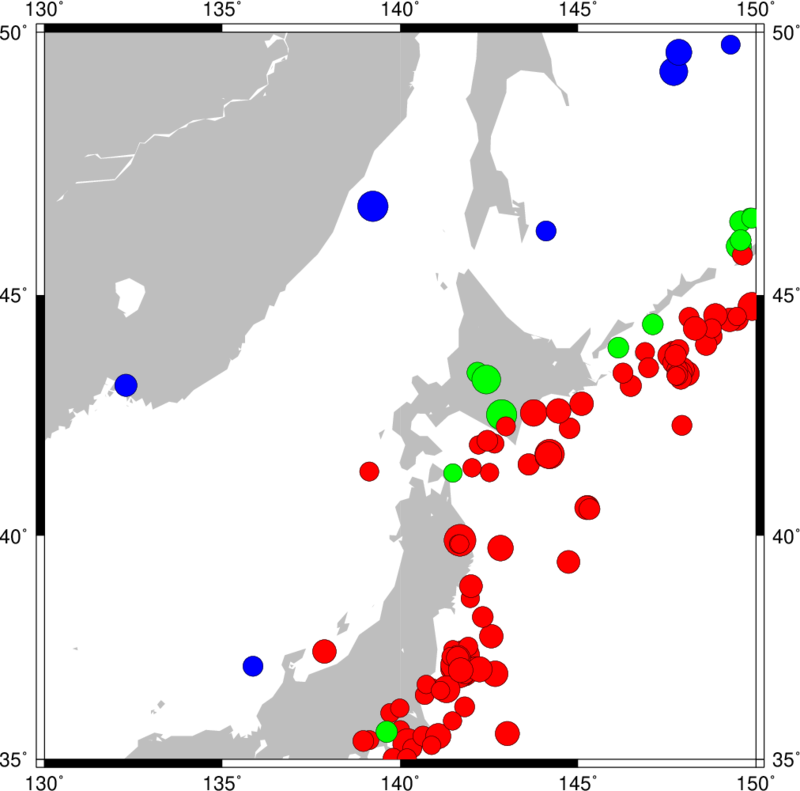 GMT 1 migrated by word of mouth (and tape) to other institutions in the United States, UK, Japan, and France and attracted a small following. Paul took a Post-doctoral position at SOEST in December 1989 and continued the GMT development. Version 2.0 was released with an article in EOS, October 1991, and quickly spread worldwide. Version 3.0 in 1993 which was released with another article in EOS on August 15, 1995. A major upgrade to GMT 4.0 took place in Oct 2004. Finally, in 2013 we released the new GMT 5 series and we have updated this tutorial to reflect the changes in style and syntax. However, GMT 5 is generally backwards compatible with GMT 4 syntax. GMT is used by tens of thousands of users worldwide in a broad range of disciplines. GMT follows the UNIX philosophy in which complex tasks are broken down into smaller and more manageable components. Individual GMT modules are small, easy to maintain, and can be used as any other UNIX tool. GMT is written in the ANSI C programming language (very portable), is POSIX compliant, and is independent of hardware constraints (e.g., memory). GMT was deliberately written for command-line usage, not a windows environment, in order to maximize flexibility. We standardized early on to use PostScript output instead of other graphics formats. 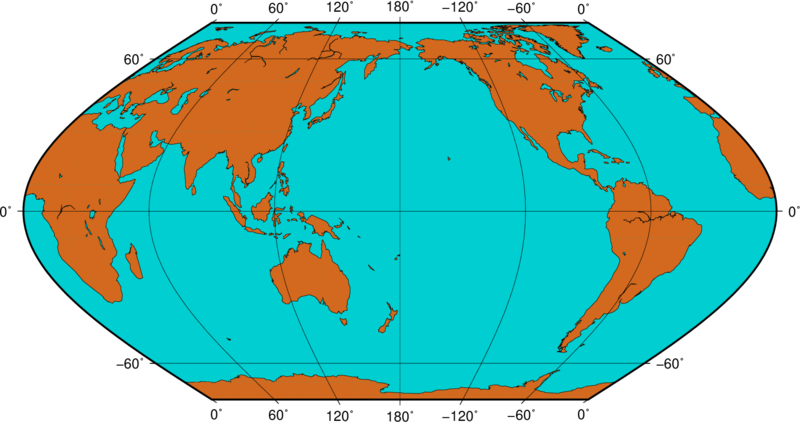 Apart from the built-in support for coastlines, GMT completely decouples data retrieval from the main GMT modules. GMT uses architecture-independent file formats. See the GMT wiki for how to install GMT. In addition, we recommend access to a PostScript previewer (e.g., gv (or ghostview or plain ghostscript)), and any flavor of the UNIX operating system (UNIX, Linux, OS X, Cygwin, MinGW, etc.). We do not recommend using the DOS command window under Windows. We assume that GMT has been properly and fully installed and that the GMT executables are in your executable path described on the GMT wiki. You should be able to type gmt in your terminal and it will display the GMT splash screen with version number and the top-level options. If not then you need to work on your user environment, adding the path to the gmt executable to your search path. All GMT man pages, documentation, and gallery example scripts are available from the GMT documentation web page. It is assumed these pages have been installed locally at your site; if not they are always available from the main GMT site. We recommend you create a sub-directory called tutorial, cd into that directory, and copy all the tutorial files directly there. Depending on your installation the tutorial files are likely in a directory like /usr/share/doc/gmt/tutorial. As we discuss GMT principles it may be a good idea to consult the GMT Technical Reference and Cookbook for more detailed explanations. The tutorial data sets are distributed via the GMT cache server. You will therefore find that all those files have @ prepended to their names. This will ensure the file is copied from the server before being used, hence you do not need to download any of the data manually. The downside is that you need an Internet connection to run the examples by cut and paste. For all but the simplest GMT jobs it is recommended that you place all the GMT (and UNIX) commands in a shell script file and make it executable. To ensure that UNIX recognizes your script as a shell script it is a good habit always to start the script with the line #!/bin/bash or #!/bin/csh, depending on the shell you prefer to use. All the examples in this tutorial assumes you are running the Bourne Again shell, bash, and you will need to modify some of the constructs, such as i/o redirection, to run these examples under csh. We strongly recommend bash over csh due the ability to define functions. Making a script executable is accomplished using the chmod command, e.g., the script figure_1.sh is made executable with “chmod +x figure_1.sh”. Please cd into the directory tutorial. We are now ready to start. To get a good grasp on GMT one must understand what is going on “under the hood”. The GMT Run-Time Environment illustrates the relationships you need to be aware of at run-time. The GMT run-time environment. The will initiate with a set of system defaults that you can override with having your own gmt.conf file in the current directory, specifying GMT parameters via the –PAR=value technique, and supply module options. Some GMT modules will read hidden data (like coastlines) but most will explicitly need to be given user data. 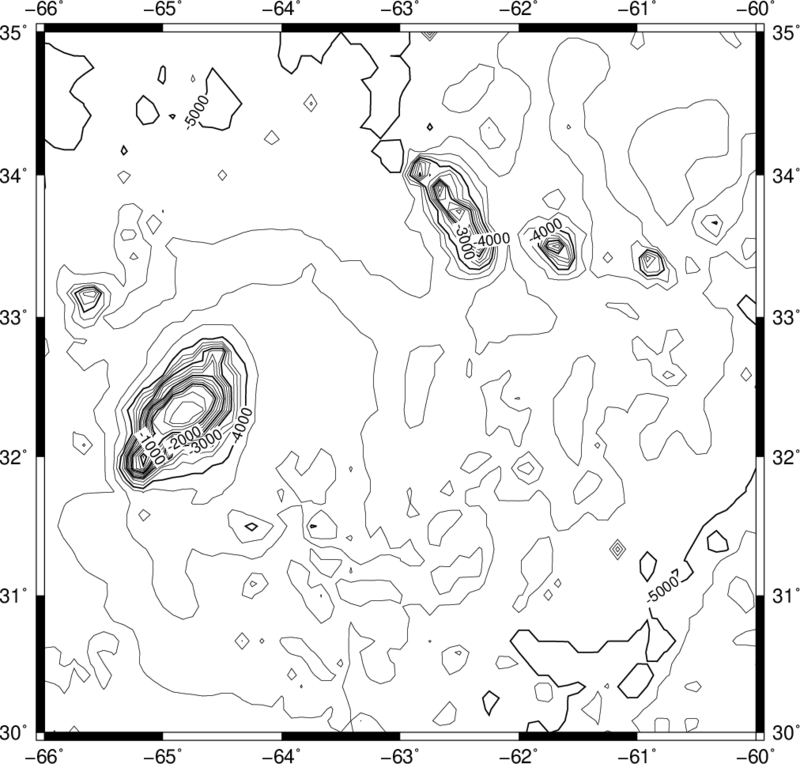 Such tables may have segment headers and can therefore hold any number of subsets such as individual line segments or polygons. You may choose among several file formats (even define your own format), but the GMT default is the architecture-independent netCDF format. Color palette table (For imaging, color plots, and contour maps). We will discuss these later. Supplied command line options/switches or module defaults. Short-hand notation to select previously used option arguments (stored in gmt.history). Implicitly using GMT defaults for a variety of parameters (stored in gmt.conf). May use hidden support data like coastlines or PostScript patterns. Warnings and Errors, written to stderr. Exit status (0 means success, otherwise failure). Note: GMT automatically creates and updates a history of past GMT command options for the common switches. This history file is called gmt.history and one will be created in every directory from which GMT modules are executed. Many initial problems with GMT usage result from not fully appreciating the relationships shown in Figure GMT Environment . In this example, and in all those to follow, it is assumed that you do not have the shell variable noclobber set. If you do, it prevents accidental overwriting of existing files. That may be a noble cause, but it is extremely annoying. So please, unset noclobber. You can save much time by getting into the habit of selecting “good” filenames that make it easy to select subsets of all files using the UNIX wild card notation. gmt module data_*.txt operates on all files starting with “data_” and ending in “.txt”. gmt module line_?.txt works on all files starting with “line_” followed by any single character and ending in “.txt”. gmt module section_1[0-9]0.part_ only processes data from sections 100 through 190, only using every 10th profile, and gets both part 1 and 2. We will begin our adventure by making some simple plot axes and coastline basemaps. We will do this in order to introduce the all-important common options -B, -J, and -R and to familiarize ourselves with a few selected GMT projections. 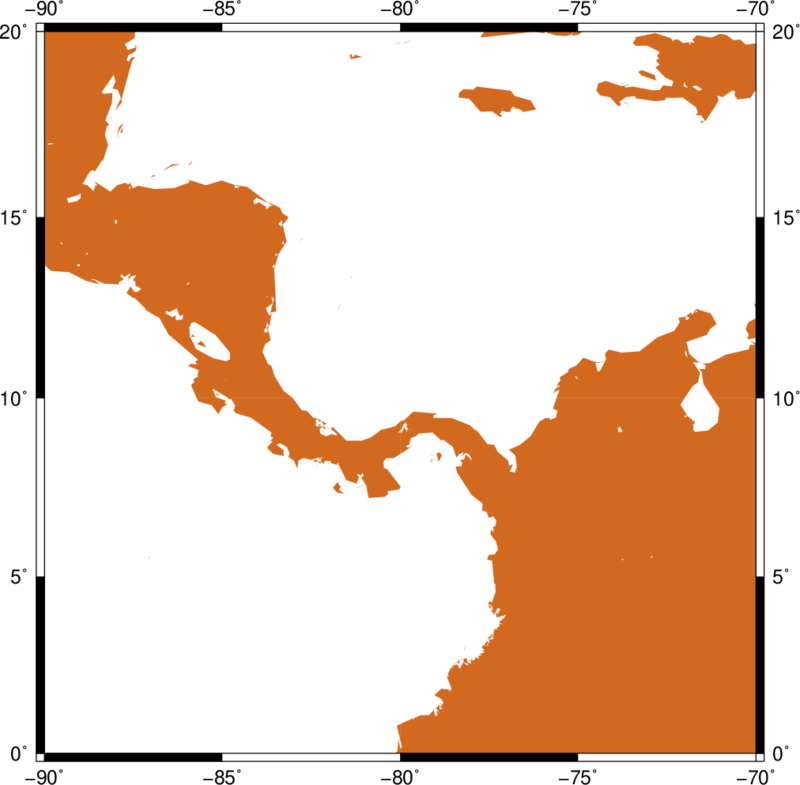 The GMT modules we will utilize are psbasemap and pscoast. Please consult their manual pages for reference. You can view the result with gv GMT_tut_1.ps and it should look like our example 1 below. Examine the psbasemap documentation so you understand what each option means. Result of GMT Tutorial example 1. Try change the -JX values. Try change the -B values. Change title and canvas color. Result of GMT Tutorial example 2. Do not append l to the axes lengths. Leave the p modifier out of the -B string. Add g3 to each side of the slash in -B. Main options when making coastline plots or overlays. Result of GMT Tutorial example 3. Try -R270/290/0/20 instead. What happens to the annotations? Edit your gmt.conf file, change FORMAT_GEO_MAP to another setting (see the gmt.conf documentation), and plot again. Pick another region and change land color. Pick a region that includes the north or south poles. 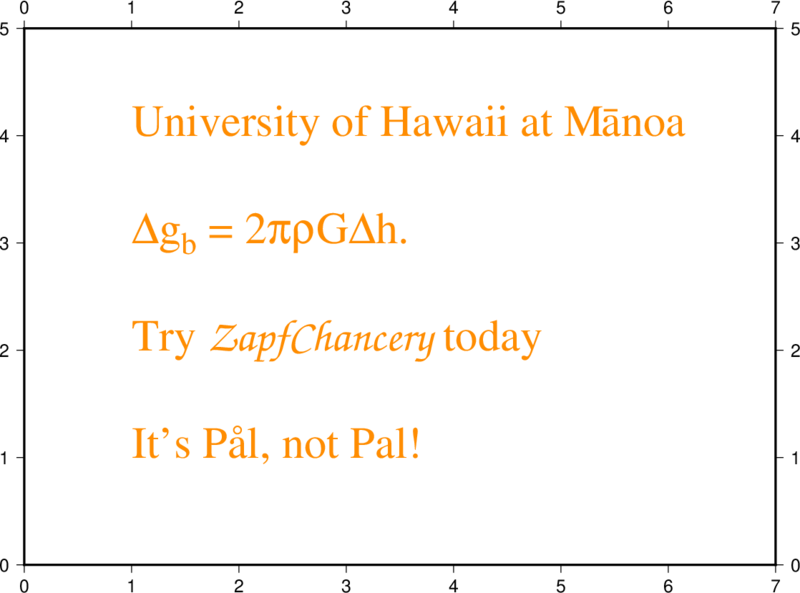 Try -W0.25p instead of (or in addition to) -G.
Result of GMT Tutorial example 4. Change the parameter MAP_GRID_CROSS_SIZE_PRIMARY to make grid crosses instead of gridlines. Change -R to a rectangular box specification instead of minimum and maximum values. 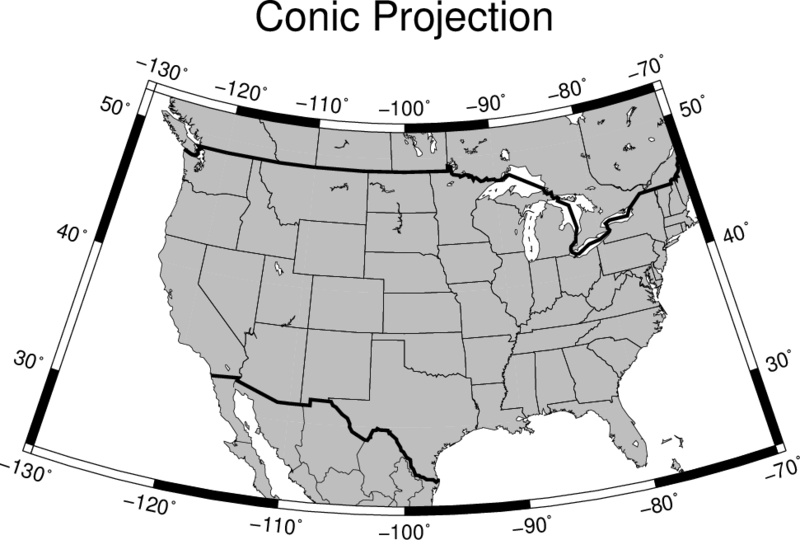 Use the rectangular option in -R to make a rectangular map showing the US only. Center the map on Greenwich. Add a map scale with -L.
There are 18 GMT modules that directly create (or add overlays to) plots; the remaining 45 are mostly concerned with data processing. This session will focus on the task of plotting lines, symbols, and text on maps. We will build on the skills we acquired while familiarizing ourselves with the various GMT map projections as well as how to select a data domain and boundary annotations. Append parameters of the vector; see psxy for syntax. The symbol option in psxy. Lower case symbols (a, c, d, g, h, i, n, s, t, x) will fit inside a circle of given diameter. Upper case symbols (A, C, D, G, H, I, N, S, T, X) will have area equal to that of a circle of given diameter. If you want the color of each symbol to be determined individually, supply a CPT with the -C option and let the 3rd data column contain the z-values to be used with the CPT. If you want the size of each symbol to be determined individually, append the size in a separate column. To draw error bars, use the -E option and give one or two additional data columns with the dx and dy values; the form of -E determines if one (-Ex or -Ey) or two (-Exy) columns are needed. 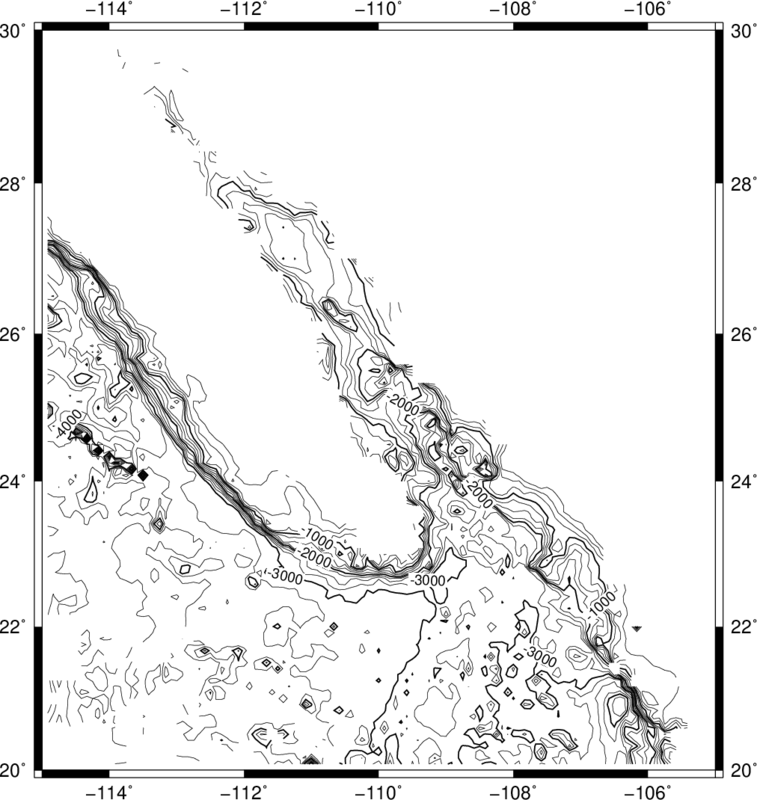 If upper case flags X or Y are given then we will instead draw a “box-and-whisker” symbol and the sigma_x (or sigma_y) must represent 4 columns containing the minimum, the 25 and 75% quartiles, and the maximum value. The given x (or y) coordinate is taken as the 50% quantile (median). If you draw vectors with -Sv (or -SV) then size is actually two columns containing the direction (or azimuth) and length of each vector. If you draw ellipses (-Se) then size is actually three columns containing the direction and the major and minor axes in plot units (with -SE we expect azimuth instead and axes lengths in km). Before we try some examples we need to review two key switches; they specify pen attributes and symbol or polygon fill. Please consult the General Features section the GMT Technical Reference and Cookbook before experimenting with the examples below. Plot the data as transparent circles of size 0.3 inches. Plot the data as solid white circles instead. Plot the data using 0.5” stars, making them red with a thick (width = 1.5p), dashed pen. Plot the data as a green-blue polygon instead. Try using a predefined pattern. Your plot should look like our example 8 below. The two-step procedure also makes it easy to plot the line over the symbols instead of symbols over the line, as here. Apart from comment lines (starting with #), each record in the CPT governs the color of a symbol whose z value falls in the range between z_0 and z_1. If the colors for the lower and upper levels differ then an intermediate color will be linearly interpolated given the z value. Here, we have chosen constant color intervals. You may wish to consult the Color palette tables section in the Cookbook. This color table was generated as part of the script (below). Let the deep earthquakes be cyan instead of blue. In many situations we need to annotate plots or maps with text strings; in GMT this is done using pstext. Apart from the common switches, there are 9 options that are particularly useful. The font is the optional font to use, the angle is the angle (measured counterclockwise) between the text’s baseline and the horizontal, justify indicates which anchor point on the text-string should correspond to the given x, y location, and my text is the text string or sentence to plot. See the Technical reference for the relevant two-character codes used for justification. Note that these escape sequences (as well as octal codes) can be used anywhere in GMT, including in arguments to the -B option. A chart of octal codes can be found in Appendix F in the GMT Technical Reference. For accented European characters you must set PS_CHAR_ENCODING to ISOLatin1 in your gmt.conf file. 1  1  It's P@al, not Pal! 1  3  @~D@~g@-b@- = 2@~pr@~G@~D@~h. At y = 5, add the sentence . At y = 6, add the sentence “It is 32º today”. Here we use the file extension .nc instead of the generic .grd to indicate that this is a netCDF file. It is good form, but not essential, to use .nc for netCDF grids. Using that extension will help other programs installed on your system to recognize these files and might give it an identifiable icon in your file browser. Learn about other programs that read netCDF files at the netCDF website (http://www.unidata.ucar.edu/software/netcdf/) You can also obtain tut_bathy.nc from the GMT cache server as we are doing below. Feel free to open it in any other program and compare results with GMT. Try tick all highs and lows with -T.
Skip small features with -Q10. Try another region that clips our data domain. Scale data to km and use the km unit in the annotations. The (x, y, z) data are available on a regular lattice grid. The (x, y, z) data are distributed unevenly in the plane. The former situation may require a simple reformatting (using xyz2grd), while the latter must be interpolated onto a regular lattice; this process is known as gridding. GMT supports three different approaches to gridding; here, we will briefly discuss the two most common techniques. The GMT module nearneighbor implements a simple “nearest neighbor” averaging operation. It is the preferred way to grid data when the data density is high. nearneighbor is a local procedure which means it will only consider the control data that is close to the desired output grid node. Only data points inside a specified search radius will be used, and we may also impose the condition that each of the n sectors must have at least one data point in order to assign the nodal value. 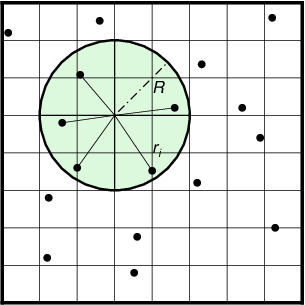 The nodal value is computed as a weighted average of the nearest data point per sector inside the search radius, with each point weighted according to its distance from the node. The most important switches are listed below. Since the grid ship.nc is stored in netCDF format that is supported by a host of other modules, you can try one of those as well on the same grid. Try using a 100 km search radius and a 10 minute grid spacing. where t is the “tension” in the 0-1 range. Basically, for zero tension we obtain the minimum curvature solution, while as tension goes toward unity we approach a harmonic solution (which is linear in cross-section). The theory behind all this is quite involved and we do not have the time to explain it all here, please see Smith and Wessel  for details. Some of the most important switches for this module are indicated below. -Aaspect Sets aspect ratio for anisotropic grids. -Climit Sets convergence limit. Default is 1/1000 of data range. We can reset all nodes too far from a data constraint to the NaN value. We can pour white paint over those regions where contours are unreliable. 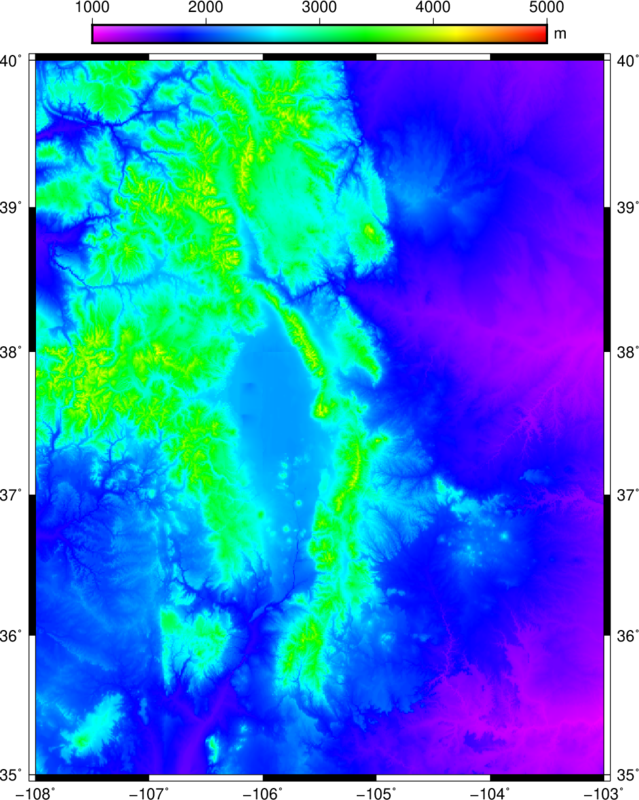 We can plot the landmass which will cover most (but not all) of the unconstrained areas. We can set up a clip path so that only the contours in the constrained region will show. Add the continents using any color you want. Color the clip path light gray (use -G in the first psmask call). Color tables and pseudo-colors in GMT. Artificial illumination and how it affects colors. The CPT is discussed in detail in the GMT Technical Reference and Cookbook. Please review the format before experimenting further. One can also make these files manually or with awk or other tools. Here we will limit our discussion to makecpt. Its main argument is the name of the master color table (a list is shown if you run the module with no arguments) and the equidistant z-values to go with it. The main options are given below. -Dxxpos/ypos+wlength/width[+h] Sets the position and dimensions of scale bar. Redo the makecpt exercise using the master table hot and redo the bar plot. GMT allows for artificial illumination and shading. What this means is that we imagine an artificial sun placed at infinity in some azimuth and elevation position illuminating our surface. The parts of the surface that slope toward the sun should brighten while those sides facing away should become darker; no shadows are cast as a result of topographic undulations. While it is clear that the actual slopes of the surface and the orientation of the sun enter into these calculations, there is clearly an arbitrary element when the surface is not topographic relief but some other quantity. For instance, what does the slope toward the sun mean if we are plotting a grid of heat flow anomalies? While there are many ways to accomplish what we want, GMT offers a relatively simple way: We may calculate the gradient of the surface in the direction of the sun and normalize these values to fall in the -1 to +1 range; +1 means maximum sun exposure and -1 means complete shade. Although we will not show it here, it should be added that GMT treats the intensities as a separate data set. Thus, while these values are often derived from the relief surface we want to image they could be separately observed quantities such as back-scatter information. 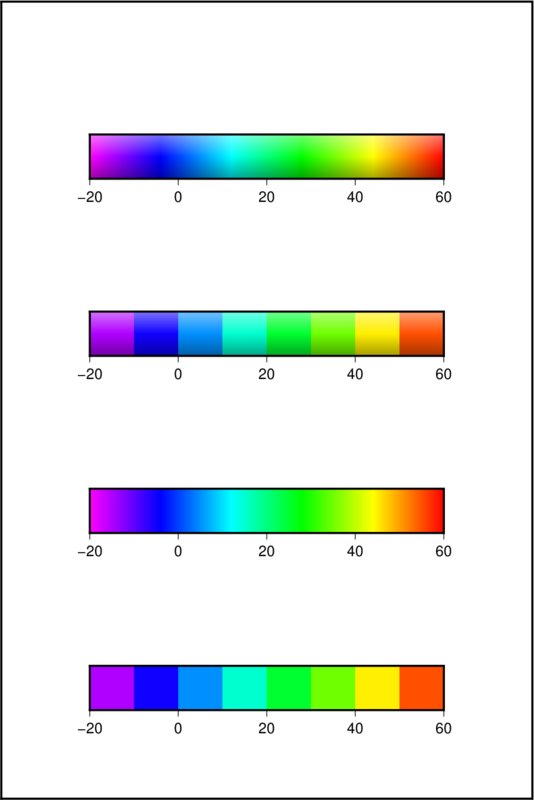 Colors in GMT are specified in the RGB system used for computer screens; it mixes red, green, and blue light to achieve other colors. The RGB system is a Cartesian coordinate system and produces a color cube. For reasons better explained in Appendix I in the Reference book it is difficult to darken and brighten a color based on its RGB values and an alternative coordinate system is used instead; here we use the HSV system. If you hold the color cube so that the black and white corners are along a vertical axis, then the other 6 corners project onto the horizontal plane to form a hexagon; the corners of this hexagon are the primary colors Red, Yellow, Green, Cyan, Blue, and Magenta. The CMY colors are the complimentary colors and are used when paints are mixed to produce a new color (this is how printers operate; they also add pure black (K) to avoid making gray from CMY). In this coordinate system the angle 0-360º is the hue (H); the Saturation and Value are harder to explain. Suffice it to say here that we intend to darken any pure color (on the cube facets) by keeping H fixed and adding black and brighten it by adding white; for interior points in the cube we will add or remove gray. This operation is efficiently done in the HSV coordinate system; hence all GMT shading operations involve translating from RGB to HSV, do the illumination effect, and transform back the modified RGB values. -N[t|e][+snorm][+ooffset] Normalize gradients by norm/offset [= 1/0 by default]. Insert t to normalize by the inverse tangent transformation. Insert e to normalize by the cumulative Laplace distribution. The GMT inverse tangent transformation shows that raw slopes from bathymetry tend to be far from normally distributed (left). By using the inverse tangent transformation we can ensure a more uniform distribution (right). The inverse tangent transform simply takes the raw slope estimate (the x value at the arrow) and returns the corresponding inverse tangent value (normalized to fall in the plus/minus 1 range; horizontal arrow pointing to the y-value). How the inverse tangent operation works. Raw slope values (left) are processed via the inverse tangent operator, turning tan(x) into x and thus compressing the data range. The transformed slopes are more normally distributed (right). 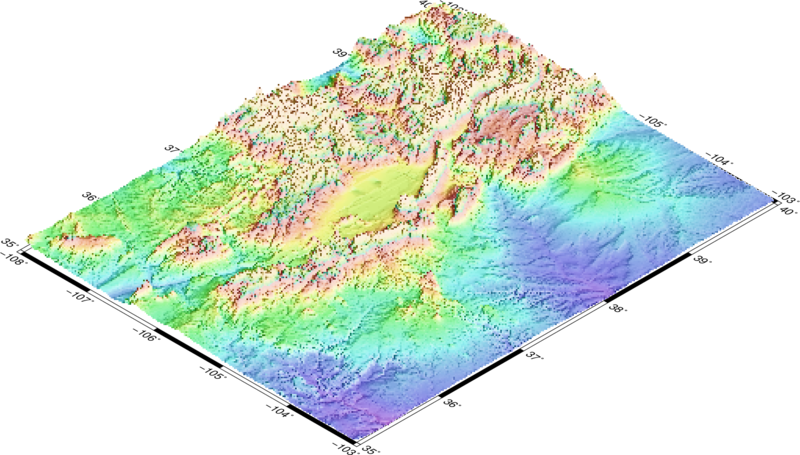 Climate data, like ocean temperatures or atmospheric pressure, are often provided as multi-dimensional (3-D, 4-D or 5-D) grids in netCDF format. 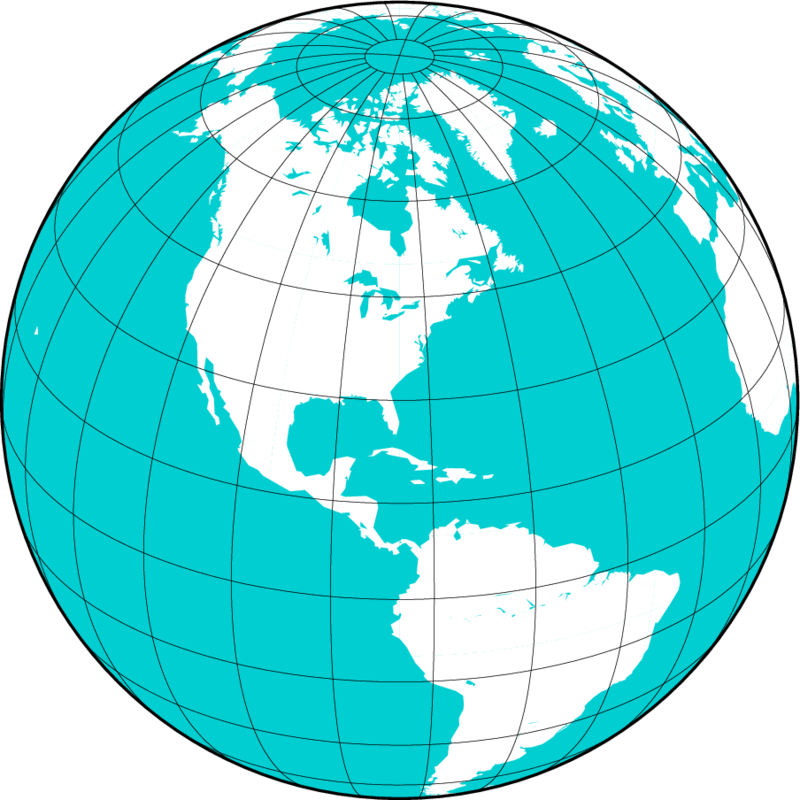 This section will demonstrate that GMT is able to plot “horizontal” slices (spanning latitude and longitude) of such grids without much effort. As an example we will download the Seasonal Analysed Mean Temperature from the World Ocean Atlas 1998 (http://www.cdc.noaa.gov/cdc/data.nodc.woa98.html). The file in question is named otemp.anal1deg.nc (ftp://ftp.cdc.noaa.gov/Datasets/nodc.woa98/temperat/seasonal/otemp.anal1deg.nc). You can look at the information pertained in this file using the program ncdump and notice that the variable that we want to plot (otemp) is a four-dimensional variable of time, level (i.e., depth), latitude and longitude. Plot the temperatures for Spring at 5000 m depth. (Hint: use ncdump -v level to figure out what level number that is). 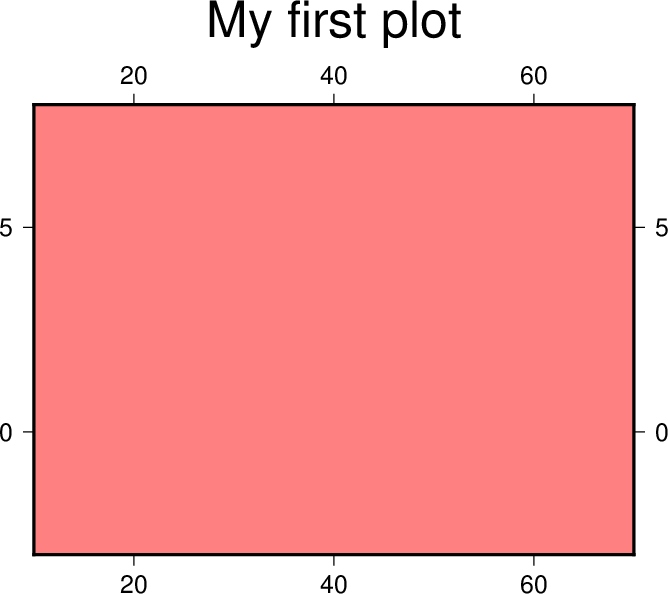 Include a color scale at the bottom of the plot. Color-coded surface (with optional shading, contours, or draping). 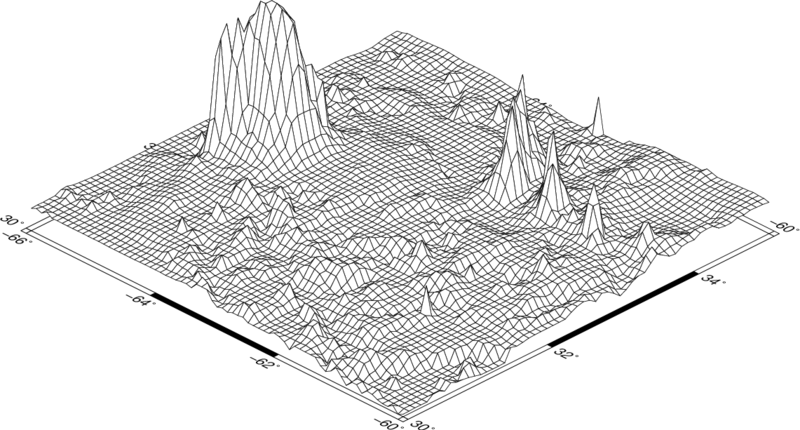 relief_file; a gridded data set of the surface. -J for the desired map projection. -JZheight for the vertical scaling. -pazimuth/elevation for the vantage point. -Qidpi[g] Image by scan-line conversion. Specify dpi; append g to force gray-shade image. -B is disabled. Select another vantage point and vertical height. This plot is pretty crude since we selected 50 dpi but it is fast to render and allows us to try alternate values for vantage point and scaling. When we settle on the final values we select the appropriate dpi for the final output device and let it rip. Choose another vantage point and scaling. Redo grdgradient with another illumination direction and plot again. Select a higher dpi, e.g., 200. 2.2. The GMT environment: What happens when you run GMT ?